Unless you’ve had your head buried in the sand during 2014, you can’t have helped to notice the incredible rise of Camden Town Brewery. 2014 was the year where they have redefined what lager is and what it can be. Alex Troncoso, Director of Brewing has appeared on the show more times than any other brewer, firstly talking about their Adnams collab ‘South Town‘, then in an interview as part of season 4’s ‘breweries of London’ series talking about Camden Hells and the brewery, and finally at the launch of the game-changing IHL. They have redefined their lager trinity and even won one of our UK Top 10 polls with Camden Hells. I could only ever finish the #12beersofxmas and 2014 with a beer by Camden Town. Only 2014 of these bottles were produced and it’s another great looking bottle with a wax seal that once I (eventually) got through it and cracked the top the immediate aroma was the sweetness from the bourbon barrels that this bock has been aged in. The colour is a deep red, almost bordering on brown with subtle carbonation. The aromas are stunning and pull you in time and time again. The sweetness is almost reminiscent of a JD & coke and carries through on the flavour to an incredibly balanced finish with no bitterness. I’m so pleased I saved this beer to the end. 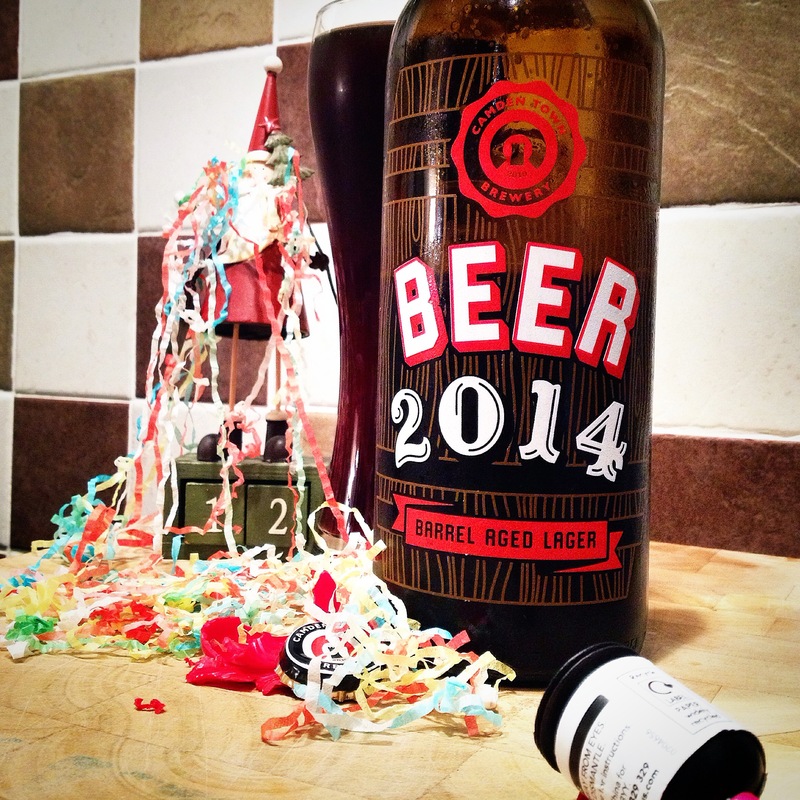 It seemed fitting to be drinking a beer called ‘Beer 2014’ on New Year’s Eve. It was so easy to drink the 750ml (designed for ‘sharing’) and I was left moreish oaky and woody aromas in my nose and flavours in my mouth. Well that’s it for the #12beersofxmas for this year. There will be a summary post coming up in a few day but in the meantime check out what else has been going on through Storify below (or on our Storify page) and check the ‘blog directory’ here for the latest writings.